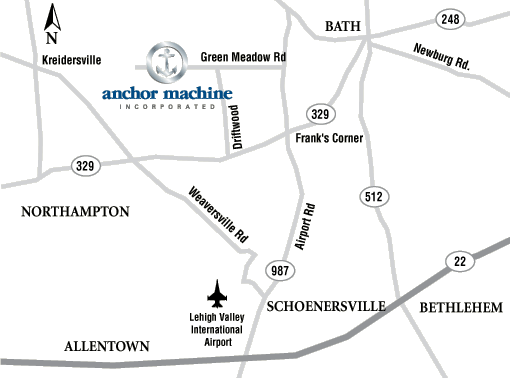 Anchor Machine, Inc. is located in Northampton, Pennsylvania, just minutes from the Pennsylvania Turnpike and convenient to New York and Philadelphia. From Allentown: US-22 E toward LVI AIRPORT. Take the AIRPORT ROAD NORTH exit and merge onto PA-987 N/AIRPORT RD. Continue to follow PA-987 N (4.7 mi). Stay STRAIGHT to go onto AIRPORT RD (0.8 mi). Turn LEFT onto GREEN MEADOW RD (0.9 mi). Anchor Machine is straight ahead and to the left past the stop sign. From Harrisburg: Merge onto I-81 N toward HAZLETON/ALLENTOWN. Merge onto I-78 E via EXIT 89 toward ALLENTOWN (51.1 mi). Keep RIGHT to take US-22 E via EXIT 51 toward I-476/PA TURNPIKE/PA-309 N/LVI AIRPORT (9.2 mi). Follow directions from Allentown above. From Philadelphia: Take PA-309 N or I-476/PA TURNPIKE N (LVI AIRPORT exit) to US-22 E. Follow directions from Allentown above. From New York City: Take the HOLLAND TUNNEL ramp (Crossing into NEW JERSEY). HOLLAND TUNNEL becomes 14TH ST. 14TH ST becomes NJ-139 W. Merge onto US-1 9 S/US-1 & 9 S/US-1 S/US-9 S. (5.7 mi). Take the I-78 WEST EXPRESS exit toward GARDEN STATE PARKWAY (0.7 mi). Merge onto I-78 EXPRESS LN W (8.6 mi). I-78 EXPRESS LN W becomes I-78 W (45.0 mi). Merge onto US-22 W via EXIT 3 toward RT-122/PHILLIPSBURG/ALPHA (Portions toll) (Crossing into PENNSYLVANIA). US-22 W toward LVI AIRPORT. Follow directions from Allentown above.